Is your tack room disorganised, dingey, or downright depressing? Learn how you can design a space for your riding gear that is both appealing and tidy, so your riding time becomes a joy. 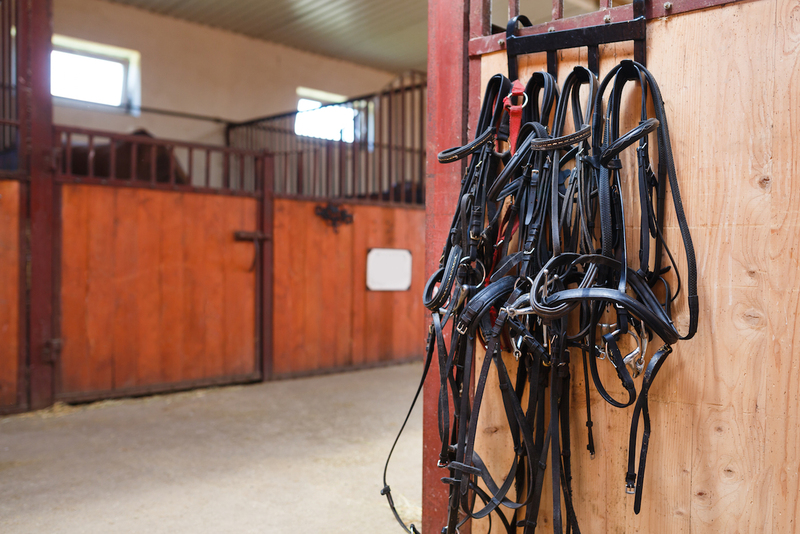 A large multi-disciplinary stables might want separate jumping and dressage areas, whereas a place with just a few riders or one discipline may want to give each rider a locker or to separate gear by type: saddles, tack, grooming supplies, etc. 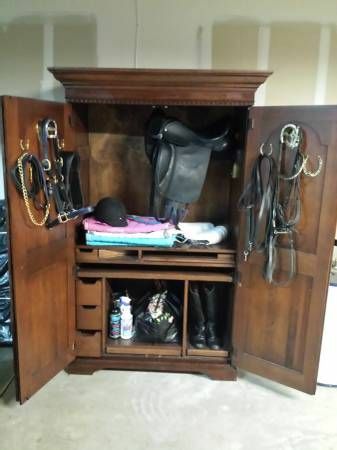 Remove everything from your tack room. Take inventory of everything you need to store and categorise: saddles, boots, helmets, whips, cleaning supplies, etc. Make note of what works and what doesn’t with existing storage, as well as what would be smart purchases to enhance your space. Make sketches to scale of how you would like a new space to be laid out. Clean your tack room from stem to stern, and then begin putting your gear back according to your new scheme. Make it a fun club day with food and a celebration afterward. Make sure you have tools in case you need to attach hardware to walls, or hire a handyman for the day to assist. If your first arrangement doesn’t work, be ready to try something different. Be practical: hang kids’ equipment where they can reach it, and keep heavier items near the door if you have to haul them out on show days. Use lockers for security in large facilities. Employ fans, dehumidifiers, and electric hearths to protect gear and keep riders comfortable in weather extremes. Invest in snug-fitting saddle covers to keep out dust and dirt and use contained storage whenever possible. Label everything to make it easier for riders to find their belongings and things like emergency first aid kits. Post rules about cleanup where everyone can see them. Rolling tack boxes have come a long way in the last decade or two. You can find boxes for all levels of rider, with those for elite riders who show featuring electric lighting, built-in safes, mirrors, mobile phone chargers, drop-down laptop desks, muck boot drawers, and customisable storage. To create a more tony interior for your tack room, you can also order bespoke tack lockers with painted exteriors and brass nameplates. You don’t need to have a tonne of resources to produce an attractive and orderly tack room. If you don’t have room inside your stables, consider converting a freight container, portable self-storage cube, or garden shed into a tack room. A wall of pegboard with metal hooks and wire baskets works well too. Even an empty stall can be turned into a tack area with a little inventiveness. Wooden beams, barrels, or sawhorses can become saddle racks. Over-the-door pocket shoe holders hold wraps, brushes, and lead ropes. Mount a wooden pallet vertically on the wall to contain whips and brooms. A shower curtain rod hung with S-hooks can hold bits. Weld together old horseshoes and mount them on the wall to create hooks for helmets, vests, and tack. Shop hardware and home improvement stores for rolling carts and tool chests that can hold horse gear too. Pinterest and Instagram are chock full of ideas that let you bring out your crafty side while making unique decorative items that are also highly functional. Did you know you can turn a family entertainment unit into a perfect tack closet? If you store your tack in a damp or mucky environment, check out durable, washable resin storage made for the garden, patio, garage, and kids playroom. Equine retailers have caught on and sell trunks made of a similar material and partitioned especially for riding gear. Once you start brainstorming ideas, there will be no end to the wonderful spaces you can create. With your tack organised and your storage space spruced up, you’ll never want to leave your stables again! Immerse yourself in the equestrian world and catch some of the best horsey moments by following fei_global on Instagram.